JENKINTOWN, Pa. (WPVI) -- It was May 27, 1980-something, and young Adam F. Goldberg was checking out the usual landmarks in Jenkintown, Montgomery County. There was the Hiway Theater, showing the latest movies. Kremp Florist offering the best in beautiful bouquets. And of course, a Philadelphia-area convenience store staple, the neighborhood Wawa. Actually, it was not 1980-something, at all. It was May 27, 2017. Saturday. 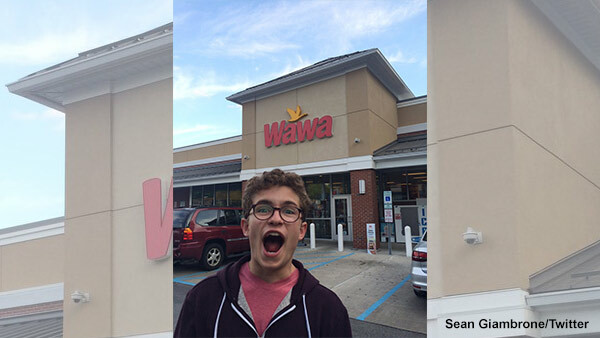 And the teen making stops at these Jenkintown haunts was Sean Giambrone, the actor who plays the youngest son on the ABC sitcom "The Goldbergs." "The Goldbergs," based on the true life story of series creator Adam F. Goldberg, centers on a kid who grew up in Jenkintown in the 1980s and the family, friends, and events that shaped his future. Giambrone, who was born in Michigan and now lives in Chicago, went on a tour of what a typical Jenkintown Saturday may have looked like for Goldberg back in the 80s. Giambrone posted three photos of his visit to the real town that is depicted on every episode of "The Goldbergs." He took a picture in front of the Hiway (which was not playing "Howard the Duck"), another giving a thumbs up at Kremp Florist, and one more outside the Wawa. But there appeared to be no sign of the Jenkintown Posse, JTP for short, the group of friends including Adam's brother Barry usually seen hanging outside the Wawa on the show. "Visiting my other hometown. Last time I was here was in 1980 something. #jenkintown," Giambrone tweeted. Based on comments under Giambrone's images, these photos were the first proof to some fans of the show that Jenkintown is real. "That is so cool! I didn't even know that town existed," one comment read. "The Goldbergs" debuted on ABC in 2013. The show was recently renewed for two more seasons. New episodes of "The Goldbergs" premiere Wednesdays at 8 p.m. this fall on 6abc.